As with Japan, we never planned to go to Korea. 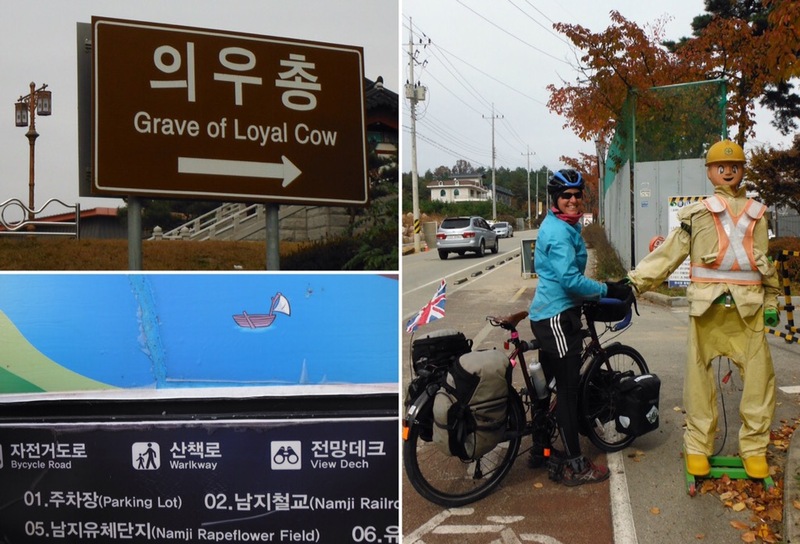 Until we read that there is an amazing network of mostly off-road, paved cycle routes that cross costs and one of these runs almost the length of the country from Busan in the south, where the ferry from Japan arrives, and Seoul in the north, from where we could fly to New Zealand. Sold. We were going to Korea. The morning we left Japan our AirBnB host had some words of advice. As with most conversations we had in Japan, he talked into his phone in Japanese and showed us the English translation. “Don’t cross the border by mistake”. We laughed. He laughed too. Then he repeated it. Even without his advice, we were pretty sure we’d be staying firmly in South Korea. As soon as we got on the ferry we realised how quiet Japan had been. The ferry, full of Koreans, was loud, and people were shouting and bustling about in a way that was not very Japanese. We found our cabin, which contained 12 cubby holes with futons and a blanket. Half of our roomies were asleep already. We realised Koreans were using plug adaptors for their phones. Hmm so we would have to buy adaptors before we could charge anything in Korea. We realised we didn’t really know much about the country we were about to arrive in. 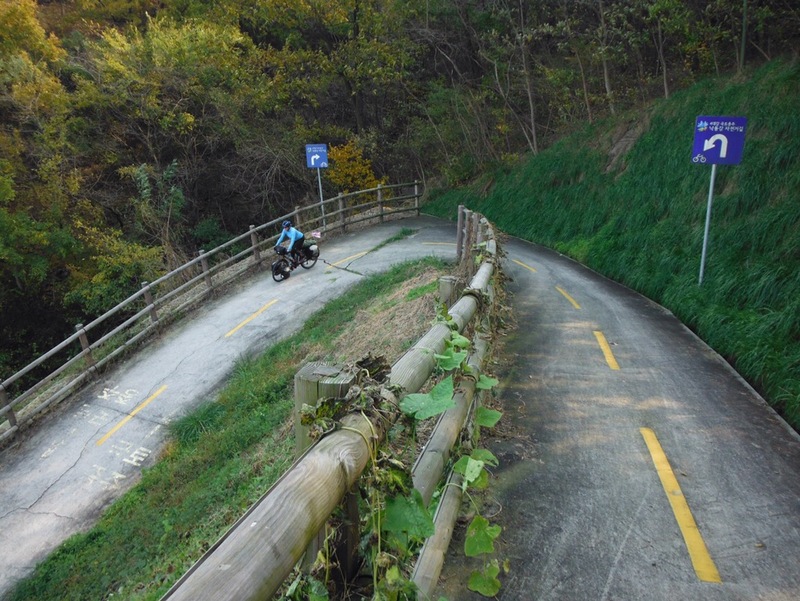 A quick google had search told us that Koreans drive on the right (Japan is left). Good to know. It was dark when we arrived in Busan. The port area was impressive, and the ferry terminal itself very like Japan, right down to the fancy toilets and the 7/11. As we were foot passengers we had to walk the loaded bikes a long way, and for the first and maybe last time, took them on a moving sidewalk. Stepping outside however was quite the culture shock. We had a 15km ride to our warm showers host, and this was not fun. No bike lanes but only big, fast roads. We stuck to the pavement but it was slow going around all the pedestrians and people selling fruit off the floor. There was a lot of litter and a grubby feel to the city. Korea was different. 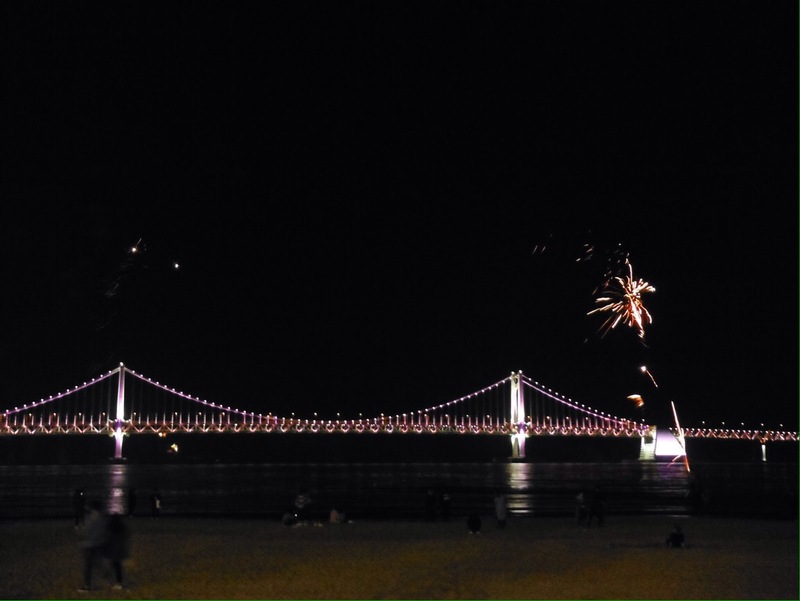 Our route took us alongside a beach – one thing Busan is famous for is nice beaches – and the waterfront area was full of people having a Saturday evening stroll. It was the 5th November and there were fireworks. We never worked out if this was in honour of Mr Fawkes or just another Saturday night in Busan. 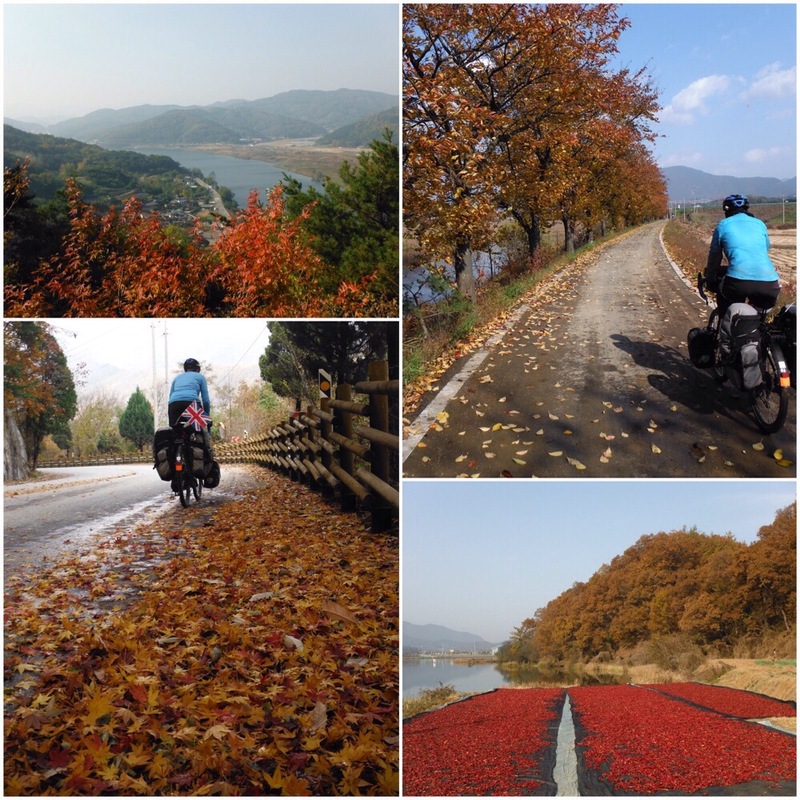 The next nine days were spent cycling the 650 kilometres between Busan and Seoul on the 4 rivers cycle route. 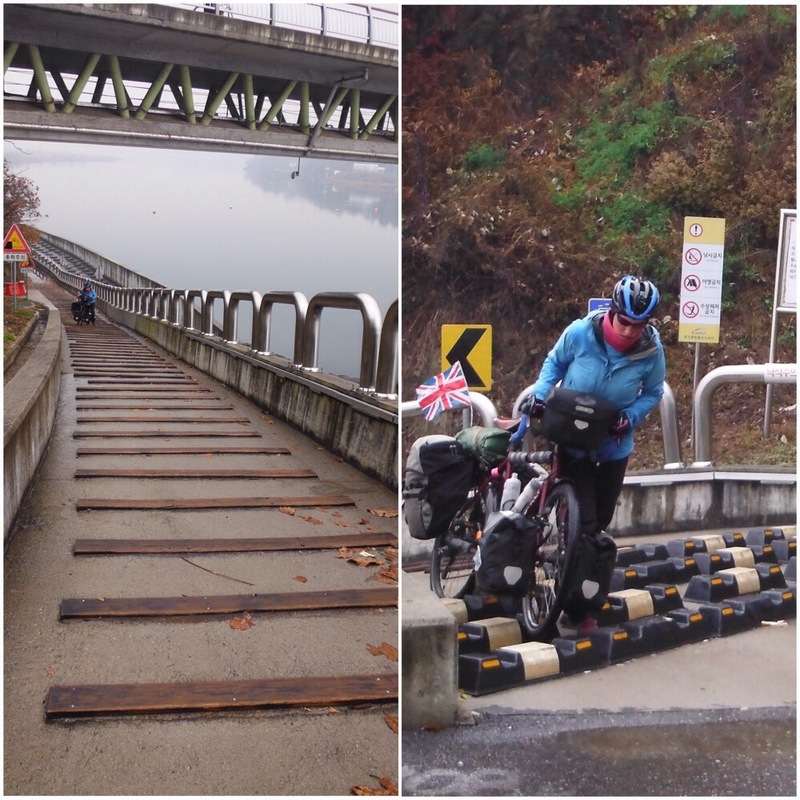 It is quite an amazing piece of cycling infrastructure – paved, mostly off-road, mostly well-maintained, loads of facilities on the route (toilets, tool stations, shelters etc). And, as you would imagine when following rivers, mostly flat. Until it isn’t, and then it’s crazy steep. Every now and then the flat path moves away from the river, takes you up a short steep hill (usually 12-20% grade), and then you plummet back down the other side back to the river. There’s a 100km stretch in the middle when you leave one river and climb over a pass to get to the next river but that was nowhere near as strenuous as the short sharp bits. There are bike bridges, bike tunnels, and even on the road, separate bike lanes. And there are regular ‘certification stations’ in old phone boxes where you can stamp each location on your cycling passport (or if like me you didn’t get a cycling passport, a piece of paper). 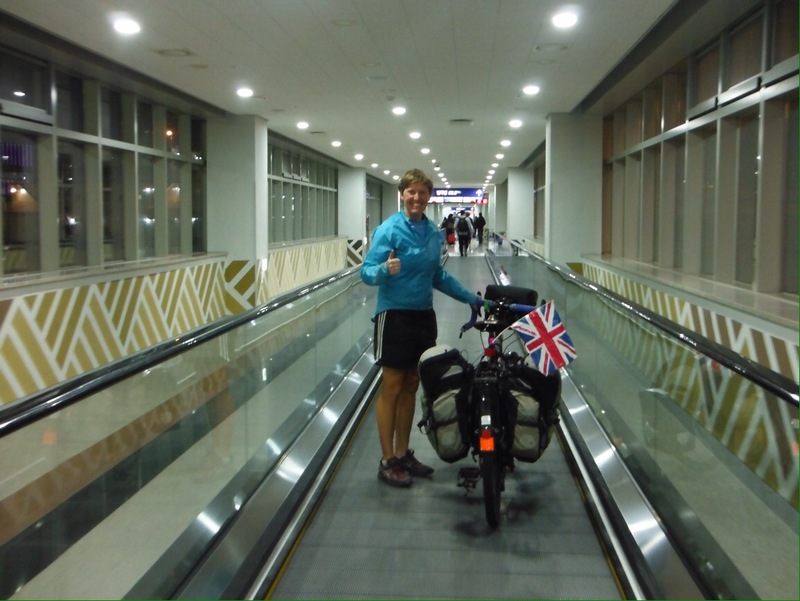 So all you need to do to get from one end of the country to the other by bike is follow the arrows. We did wonder if this would get a bit boring, and to be honest the first couple of days were a bit drab – Busan was ugly and went on for ages, and even beyond the city, it was all quite built up. As with Japan, Korea doesn’t seem to do visually appealing cities. So the view was often ugly grey high rise towers and industrial buildings. But this petered out eventually and after those first couple of days the scenery picked up, the sun came out, and life was all good. Riding on a bike route for all that time didn’t lose its novelty at all. Being away from the traffic was great. And autumn was in full swing, so the colours were spectacular. Autumn also brought us a return to cold camping, last year at this time we were having some chilly nights in the tent in Europe, and Korea beat that. Our third night was the coldest, as we woke up to find everything covered with a thick layer of frost, including the bike computers. After de-icing it we could read that it said -6 (Celsius). Brrr. A great excuse to eat chocolate in your sleeping bag though. The next couple of nights we escaped into motels. 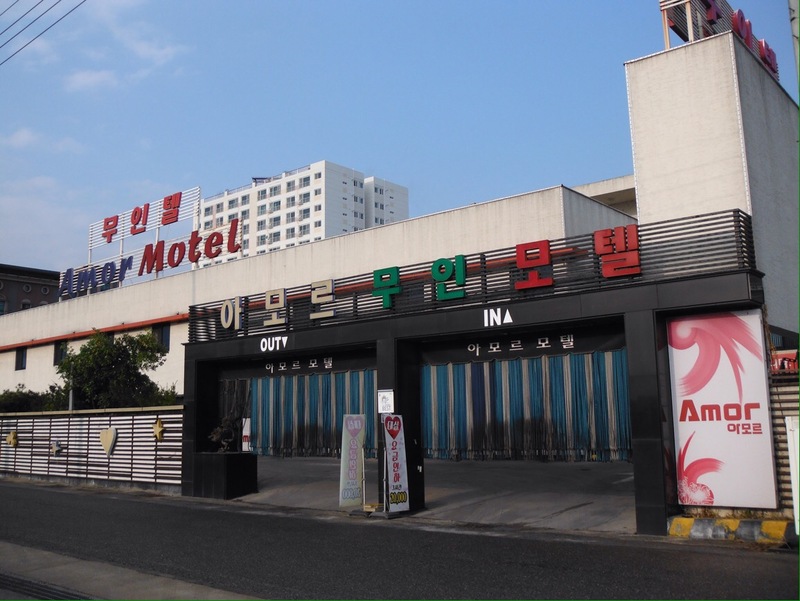 This included a motel with bike lockers on the ground floor, and our first love motel experience. After hearing about these ‘by the hour’ motels in Japan we were expecting seedy and run down, but this was modern, clean and excellent for the cyclist. Loads of space, a big bed, nicely decorated, a desktop computer, a huge bath, free toiletries, a personal garage to store the bikes…. (which was also useful for cooking dinner on the trangia). Everything is a bit secretive in that it is designed for you to drive in, park in a garage, take a private entrance to a room, check in automatically and pay by credit card without being seen by another human being. For us it was a perfect and fairly cheap way to get a good warm sleep. Camping was easy as there are lots of parks and shelters just off the bike path and nobody seems to care about foreigners just pitching up anywhere. So after two nights of motel luxury we returned to the tent, and a couple of nights later realised that we were not that crazy camping in the cold after all. It was a Saturday night and we came across a camping area on an island in the middle of the river. It was packed. There must have been at least 80 other tents – families, young couples, groups – in November. In Europe you would struggle to find an open campsite, never mind anyone brave enough to camp. There were a few gas heaters visible, but as it was a walk-in campground, not many luxuries. 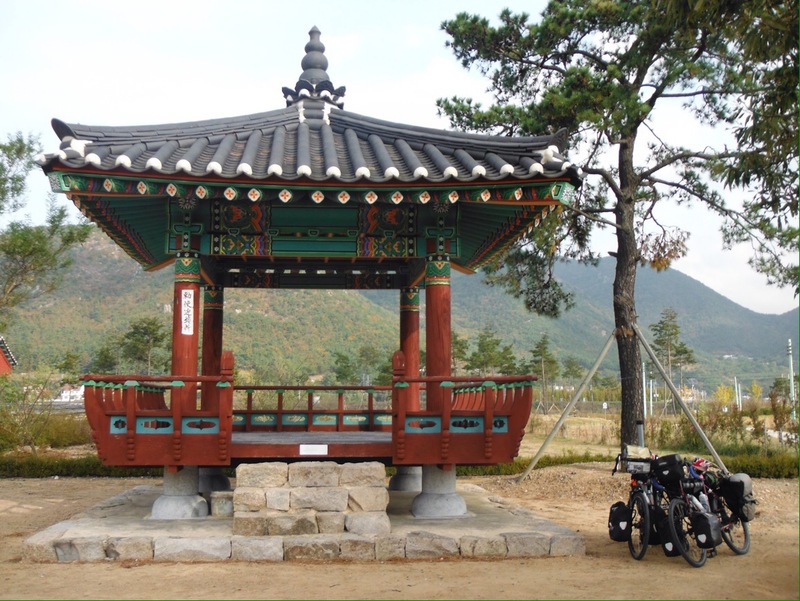 Other than an ability to camp in all weathers, the other thing we learnt about Korean campers was their ability to maximise a weekend away camping. 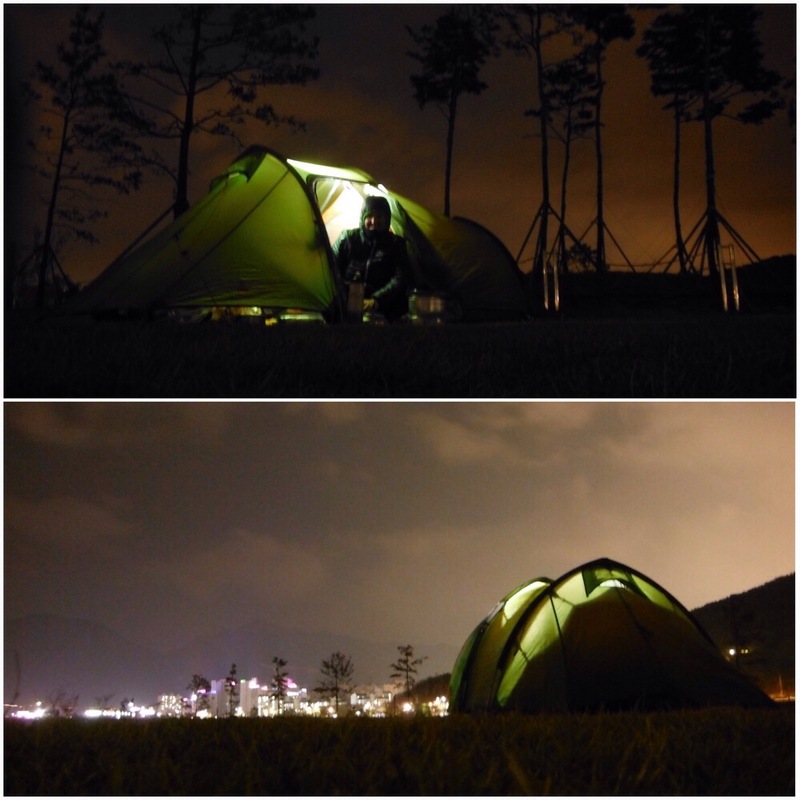 On our first night we pitched our tent at 4pm on a Sunday afternoon at a fairly full campground just outside Busan. An hour later we were cooking dinner and realised a few people were packing up, including our neighbours who were in the middle of a full on BBQ when we arrived. By 6pm it was dark, and more people were packing up. We woke up the next morning to two other tents left. If you go camping for the weekend with some Koreans, don’t expect to be home until late on Sunday night. And take an extra jumper. We only really left the bike route to find food. This in itself was quite an experience. Somehow we only managed to end up in places where there were no pictures on the menu, just Korean. The first time we managed to order the only thing we knew how to say, bibimbap (fried rice and veg), with success. At the next place, when we were asked what we wanted to order we just shrugged our shoulders and smiled. This didn’t result in an order being taken, so I mimed that I’d like to look in the kitchen, after being shown a couple of huge pots of broth and meat I picked one and pointed at some rice too. We were a bit concerned when the first thing that arrived was a plate with tongs and a pair of scissors on it but luckily this was shortly followed by a bowl of seolleongtang (oxbone soup) and a demonstration of cutting the meat off the bone with the scissors provided. And many other small bowls of food including the tiniest fish I have ever seen and the usual kimchi (fermented cabbage in a spicy sauce). As we were finishing off the soup we were brought a tray of spicy meat. It seemed that the only foreigners in town should also try bulgogi (grilled marinated meat), with more demonstrations of how to eat it (take a lettuce leaf, put in a bit of meat, some sauce and a bit of rice, in the middle, wrap it up and shove it in your mouth). It was a bit spicy for me so I put a bit of extra rice in and was promptly told off with a good strong strike to the arm. It was lots of fun. Continuing some themes from Japan, we saw more model people and bad English translations. In contrast to Japan, the vast majority of other cyclists we saw were recreational, usually on flashy road or mountain bikes. People didn’t seem to ride functionally (at least not in November, maybe they are all busy camping). We enjoyed that the bike path cycling outfit consists of covering as much skin as possible. As it got colder we realised the sense in this, and adjusted our clothing accordingly. Cycle trail buddies. The tall guy in the middle is a famous Korean actor. He has 1.8 million instagram followers, so he must be famous. 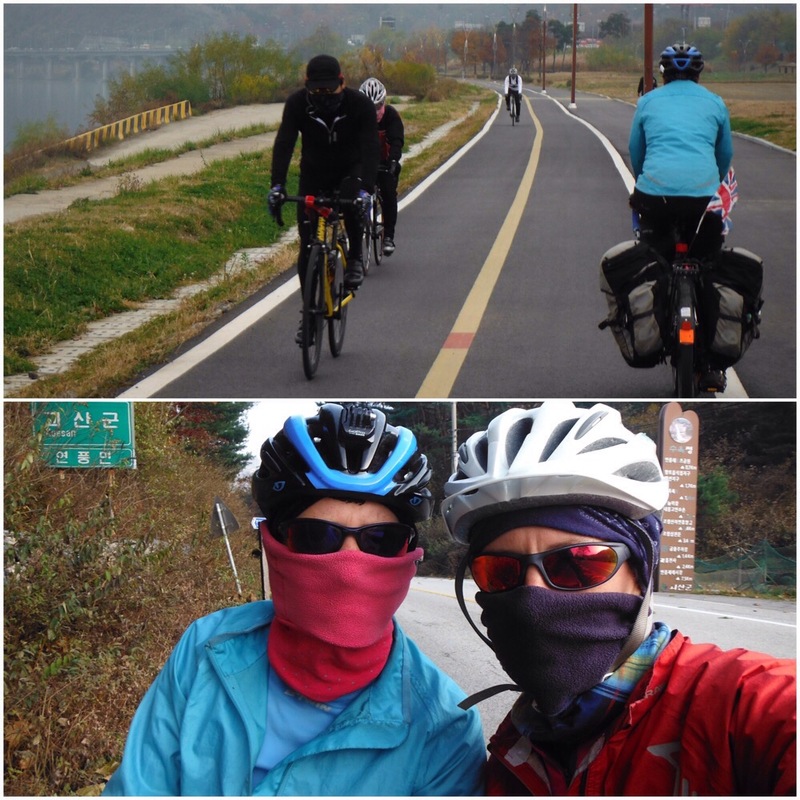 The bike path was fairly well used, particularly considering the temperatures, and as we approached Seoul on a Sunday afternoon we were weaving in and out of families, racers, and tourists taking selfies or falling off. Before we knew it we were in Seoul. It looked to be a cool city to explore but as we spent our whole day there hunting for bike boxes ready to pack the bikes for the flight, we only explored the bike shop scene. And became well versed in the subway system. This usually simple task was actually very difficult in Seoul as shops have limited space so don’t keep empty boxes longer than a few minutes. We must have visited 20 bike shops, split up at one point to cover different parts of the city, and ended up with 5 boxes, only one of which was full size. Our last night in Korea was spent eating a huge meal at the market for the equivalent of £2.50 and then dismantling our bikes in the narrow hostel corridor. 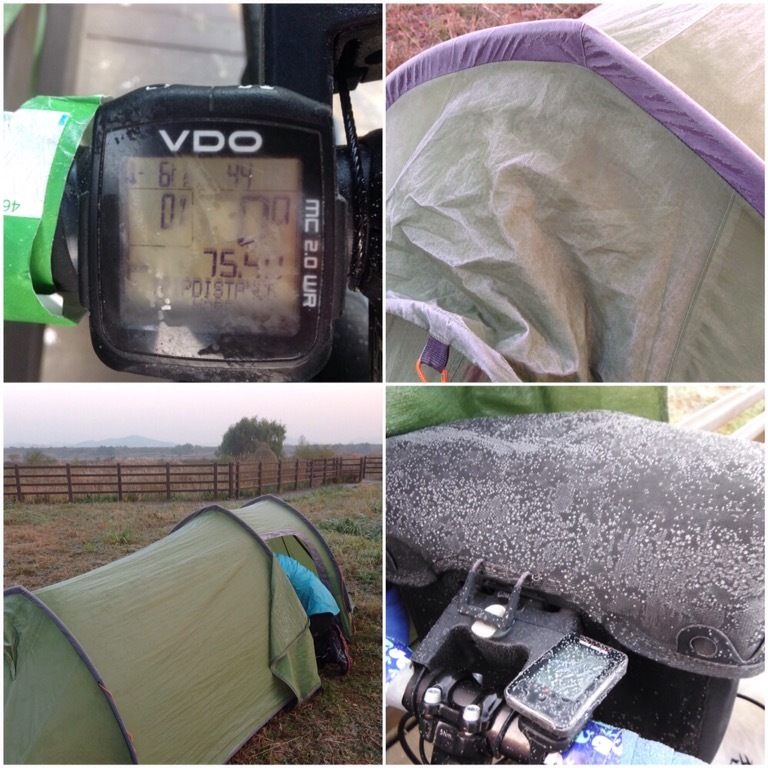 Cycle touring isn’t all glamour. Korea was fun. Being off the road was great, and the scenery on the whole was pretty nice (if not wow). Ten days was maybe long enough for us on the bike route, but there are attractions you could divert to if you wanted to spend longer in the country. 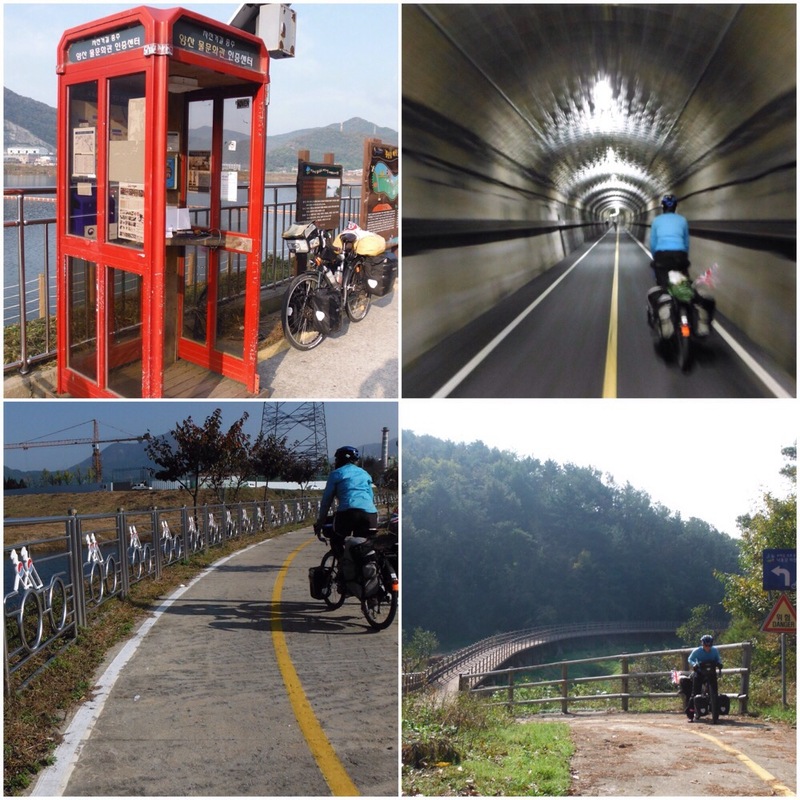 Sticking to a cycle path gave us a certain perspective of Korea – spend more time in towns and cities and I’m sure it would be different. 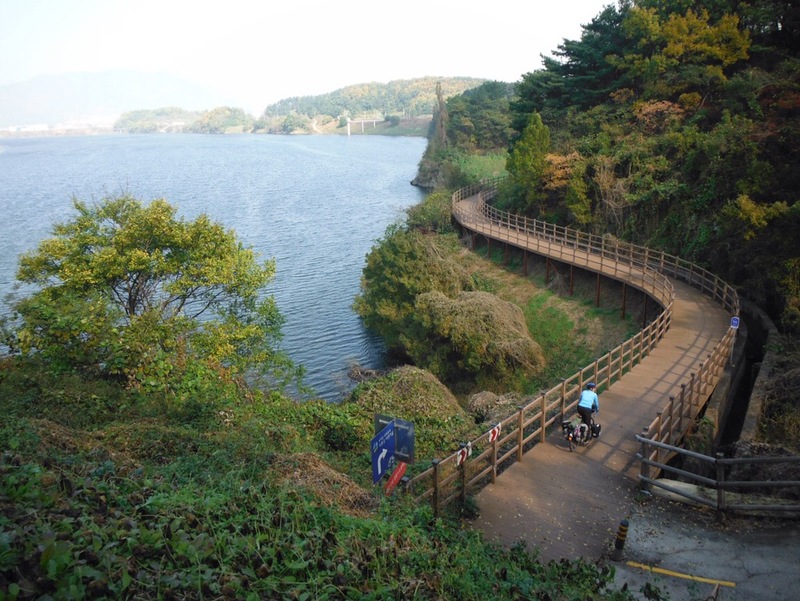 We highly recommend the 4 rivers cycle route, certainly if done in conjunction with a trip to Japan. Though we are not sure where the other two rivers went as we definitely only cycled along two. Thanks to Chris in Busan; and Jess and Tim for the (fake) chocolate digestives.